After years of field testing new products, every once in awhile a new product comes along that gets my attention. The new BulletBobber invented by Paul Lieb in Ohio has me excited, and I want to be sure MidWest Outdoors readers are aware of the product and it possibilities. Why would a dedicated bass and walleye angler get excited about a bobber? There are numerous reasons. The BulletBobber is much more than just a floatation device for live bait. 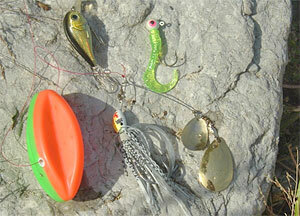 It offers the angler unlimited possibilities to use not only live bait, but also artificial lures. It doesn’t even matter if you’re bank fishing or fishing from a boat. The BulletBobber works just as well either way. The BulletBobber can be attached stationary or used as a slip bobber giving the angler complete depth control. The new innovative product is as much a planer board as a bobber. The bobber’s design allows anglers to “guide” the bait in any direction. Bank fishing anglers can cast the BulletBobber to the shoreline on their right and work the bait all the way from the right shoreline of the angler to the left shorline and cover all the depths and cover in between. The two-tone orange and green colors make visual contact easy at all times. Boating anglers can use the BulletBobber to actually swim a bait under any floating dock, swim up to and around stumps, tress or other stationary cover and keep the bait in the strike zone for long periods of time which can be the key to success in cold water situations or during a cold front. The BulletBobber can also imitate the popular Zara Spook’s “walk the dog” action and impart that zigzagging action to any bait below the bobber. Imagine a jig and twister tail walking the dog underwater! How about a spinnerbait that darts back and forth instead of swimming in a straight line? I used the BulletBobber with a ¼-once jig and twister tail, a 3/8-once spinnerbait and a small shallow diving crankbait. Each lure performed well under the bobber. One of my favorite techniques with the BulletBobber is to skirt the edges of boat docks. With conventional bobbers, you can only cast to the outside edge of a dock and leave the bait to sit. With the new bobber and a slow retrieve, the bobber will actually keep contact with the support barrels, Styrofoam or whatever the floating dock is made of. This gives fish hiding under the dock a clear and unique look at the bait. The BulletBobber keeps the bait parallel to the dock. By using a little force, the BulletBobber will even make a little scratching noise as it skirts the dock which can attract fish out from under the dock to investigate the sounds. The bobber can also be “popped” to create additional noise. No matter which bait you select to use along riprapped or diked shorelines, the BulletBobber assures that the bait will stay in contact with the structure at all times. When using a crankbait, the lure tends to deflect off the cover and each time it does, it moves farther away from the cover. With the bobber’s guidance system, the bait hugs the shoreline all the way back to the angler. This gives fish hiding in the rocks plenty of opportunities to attack the bait. When fishing stumps, the bobber will swim the selected bait right up to the stump, but with the BulletBobber’s unique design, the bait won’t snag. The pointed end of the bobber strikes the stump, but keeps the hook about an inch from the wooden structure. By gently pulling on the line, the bobber will slide around the stump, instead of snagging it. I would like to try these out. Do you know where I can buy these in a store? I just purchased several of these. I will let you know how they work!